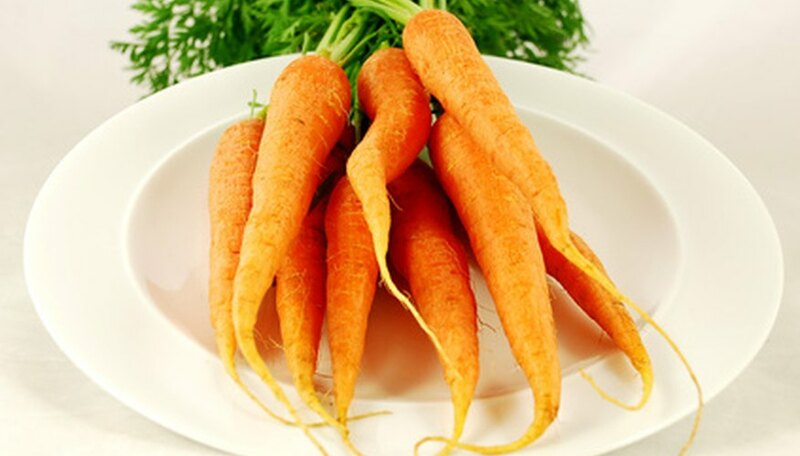 Herbicides for carrots are an essential part of growing carrot crops because carrot leaves are too thin and delicate to compete with invasive weeds. To prevent an infestation of weeds, the University of California IPM Online suggests a program of using a pre-plant or pre-emergent herbicide and then a post-emergent herbicide. Using only one herbicide may not provide adequate weed control. Pre-plant herbicides are those that are applied to soil before the crop is planted. Metam sodium should be applied to evenly mixed, irrigated soil two weeks before planting. Glyphosate should be applied to soil beds before planting carrots; allow a duration of three days to pass before planting, as directed by the University of California IPM Online. Trifluralin is used as a pre-plant herbicide to control annual grasses as well as broad leaf weeds in carrot crops. Apply this treatment into the top 2 to 3 inches of the final seedbed. Pre-emergent herbicides are applied before the carrot plants emerge from the soil. Trifluralin (also used as a pre-plant herbicide) is applied to inhibit weeds from germinating. Apply with water used for irrigation. Linuron is applied with sprinklers to control annual grasses and broad leaf weeds. Pendimethalin needs to be applied before weeds emerge for successful control, as recommended by the University of California IPM Online. Post-emergent carrot herbicides are applied after the carrots have emerged from the soil. Sethoxydim controls grasses and is not harmful to the carrot crop but do not use during drought conditions. Clethodim is a post-emergent carrot herbicide that is affective on annual bluegrass when two to three leaves are present, as well as certain annual and perennial grasses; apply with crop oil and avoid applying with water, as directed by the University of California IPM Online.